In 2006, Al Velocci, Sam Berliner III, Pat Masterson and I explored unusual sections of the Long Island Motor Parkway including this week's Mystery Foto location. -Identify the location of the photo. This is the northern boundary of the Long Island Motor Parkway in the Battle Row Campgrounds of Old Bethpage, east of Round Swamp Road and west of Claremont Road. -What exactly are Al and Sam looking at? 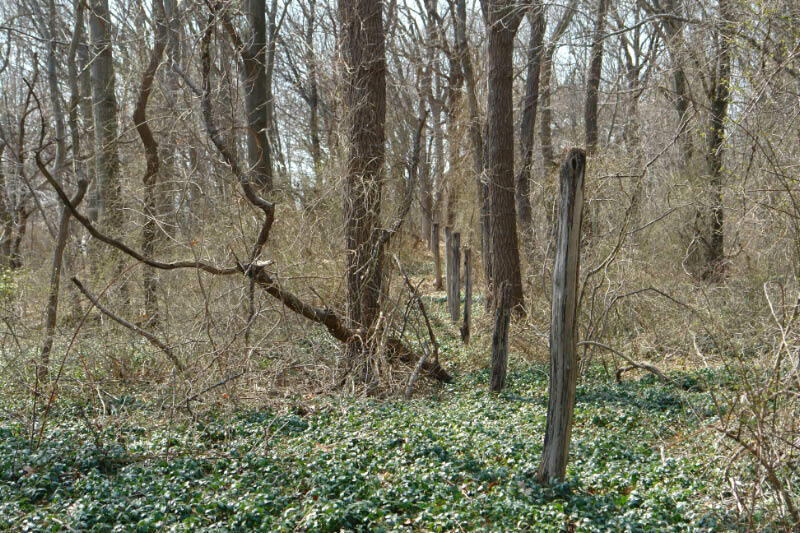 The original cedar posts of the Motor Parkway placed here to keep cars and animals off the road around 1909-1910. Amazingly, the wooden posts have survived. Congrats to Bruce Adams, Frank Femenias, Joe DeBono, Tim Ivers, Art Kleiner, Brian McCarthy, Greg O. , Joe Osterle and Ted for correctly identifying the locations and the wooden posts. Great image of Al and the line of cedar posts. Most of the cedar posts were replaced by the ever-present concrete Motor Parkway posts. The eyelet held wire between the posts. From left to right: Pat Masterson, Al Velocci and Sam Berliner III. I was the photographer. Battleground Row. East of Round Swamp Road, before the LIMP passes into what is now Old Bethpage Restoration. The posts are the original LIMP wooden posts, which predate the cement posts that are still found on some of the old right of way. 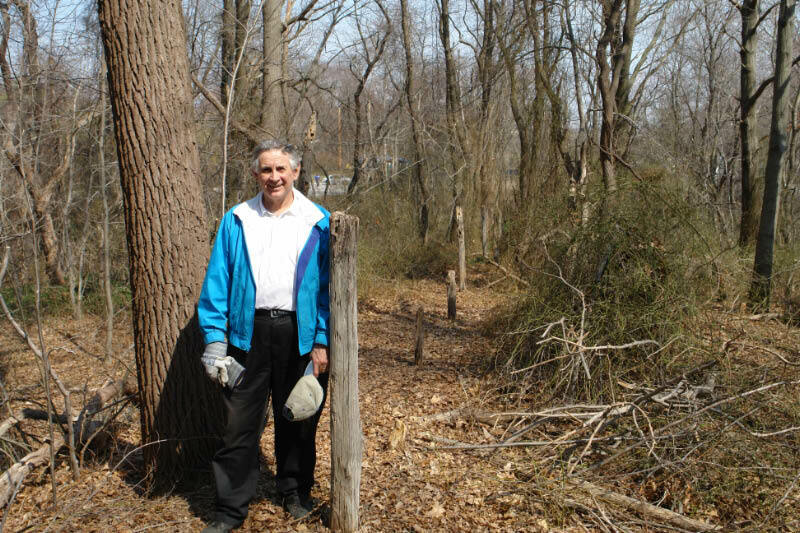 The Boundary markers at Old Bethpage Village Restoration area? My guess would be the Bethpage Bikeway before they uncovered it and restored it. The last picture lookd down from an embankment at the guys, maybe the old botto bridge ? Wooden post had an eyelet through it, not necessarily a guard rail, but an outer fence to keep motorists seperate from the farm. Purely a guess since theyre deep in the woods. 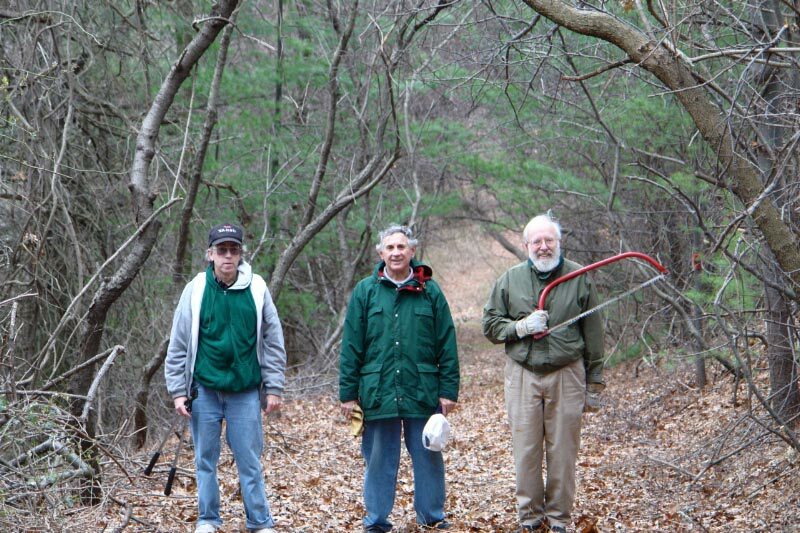 It looks like the cleanup crew at the Old Bethpage LIMP location in 2006. 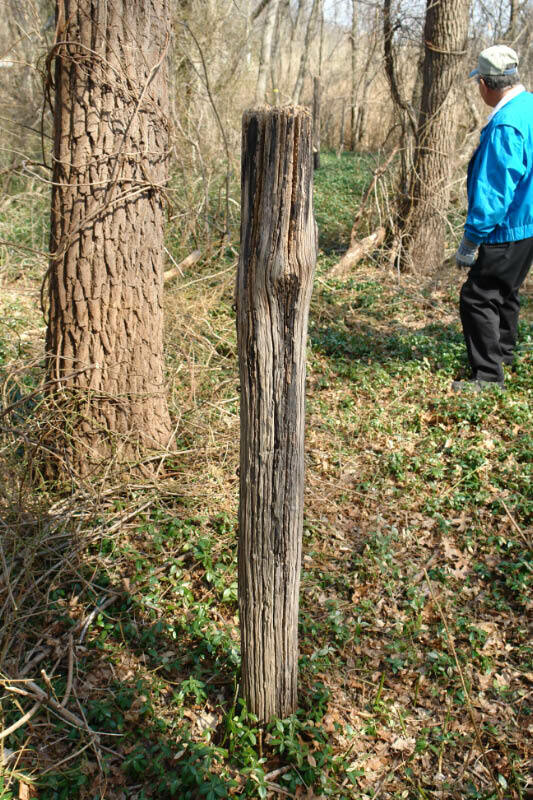 The wooden posts were original markers along the parkway. Location is Old Bethpage. Might Al and Sam be looking at fence posts to keep animals (and maybe humans) off the roadway. I think you men were near the OBVR bridge (Clody). I’ve seen those wood posts as ROW boundary fencing for the LIMP in some of the old photos. And the wood posts are in a straight line. Could this be Wheatley Heights? I have no idea what the post is. 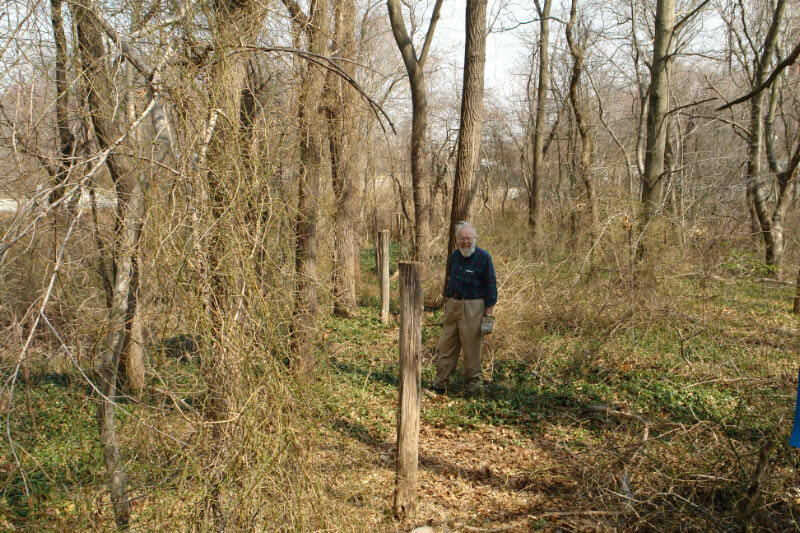 Property line fence posts in OBVR and Battle Row campgrounds. These guys are deep in the woods. Past experience has taught me to conduct these types of investigations prior to April, or you will be eaten alive by all types of insects. Otherwise you’ll need a suit of armour. Amazing how the 100+ year old cedar posts have endured the test of time! Thanks for being late, it gave me a chance to give you the right answers. How did those posts last so long? 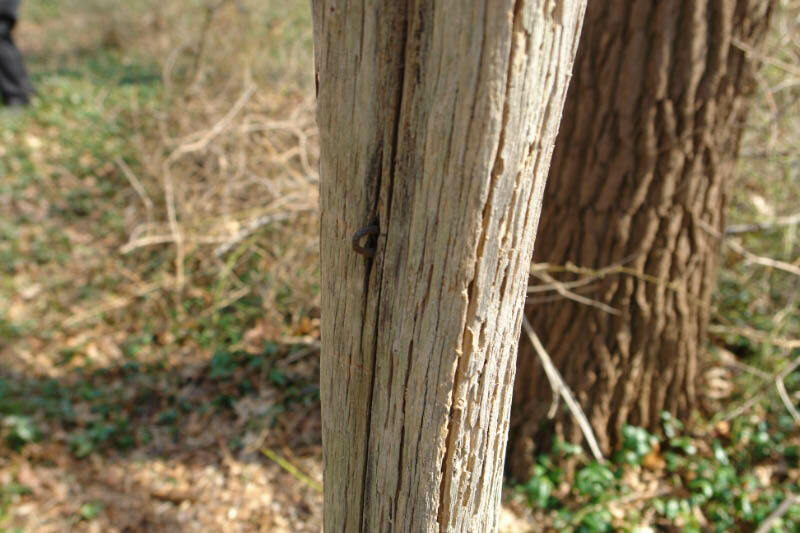 The posts found along the LIMP in Old Bethpage are locust I think. Cedar would not last that long. The ones still standing are still pretty strong. What happened to S Berliner III, could absolutely identify? Harry, you may be right. Here is a link of the type of wood that they used for fence posts in the early 1900s.